This week’s assignment tip is about complementary assignments… I don’t recall when someone gave me this tip but I’m always happy to pass this along. Not only do we want our students to read for content and argument, but we also want them to synthesize and expand their analysis across texts. Analysis of two separate texts is usually done with CONTRASTING views. That is to say that we select texts that are opposed in position–the “taking sides” approach, but this tends to eliminate the opportunity to synthesize and see connections. So….Let’s talk COMPLEMENTARY……. This is an assignment of two texts that are seemingly different at the outset, but are ultimately closely aligned. Step 1: Have the students read Pericles’ Funeral Oration–this is Thucydides’ telling of the motivational speech regarding war, war death, and how to pay homage to those who fall.You could easily squeeze it in on a segment on political violence or causes of war (rally round the flag effect). Step 2: Have the students mark up the text with the usual notes and outline of the argument. My favorite questions are always in play: What is the speaker trying to do? How is he trying to do it–what evidence? What is compelling? Step 4: Hand out a copy of the Gettysburg Address and provide a brief explanation of the where and when of this address. Step 6: Have students do step 2 for the address but in class. You can have them work in pairs or on their own. Step 7: Open the class to discussion. Have them compare and contrast the two speeches…. and discuss. ***cheat *****… if you want a head start… someone was kind enough to write this Foreign Policy Article. Then…. watch…. as they start to synthesize…. see across texts…. If you want to expand this activity into a research activity–(a la Chad Raymond’s PBL in the prior posts) do the comparison near the end of class and generate questions for research. 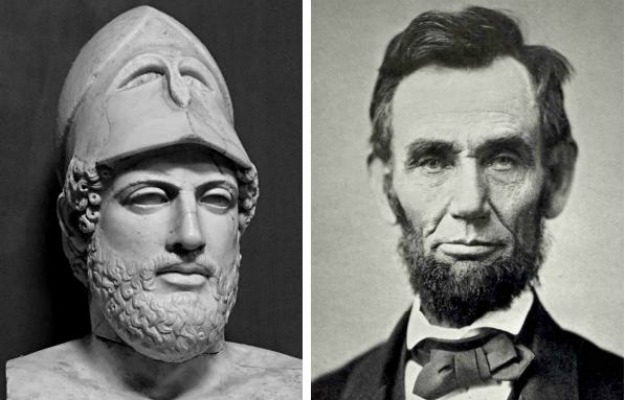 Usually you will find a few students asking: ‘Did Lincoln read Thucydides?’ Once you have your questions set, designate groups to return to the next class with answers…. it is a highly portable exercise that can be stretched to fit most courses. **Analysis…. there’s something important in analyzing complementary arguments in addition to contrasting ones. 1. Specifically, it asks students to look with an even more refined eye at the texts to get under the deep assumptions to see if the two pieces really do agree. It is a much finer discussion with a higher degree of fidelity. 2. The assignment not only bootstraps two wonderful pieces of history into the student’s hands, but in being complementary it adds a degree of historical timelessness. History does rhyme. 3. Contrasting assignments are less available to students for synthesis which is a skill we want our students to develop. In this sense, while politics tends to be cast as the great debates of history, this notion is somewhat overplayed. 4. Complementary assignments allows the students a basis for building theory and seeing how things are connected rather than isolating them as discreet instances in the human experience. I’ll be offering a paper on game simulation and complementary and contrasting work for teaching and learning conference next year (Philly 2014). Let’s hope I get in!